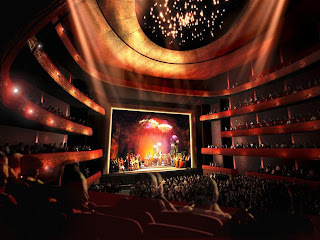 Yesterday, I came across a wonderful article detailing the behind the scenes story of The Dallas Opera's new opera house. The Margot and Bill Winspear Opera House, partly funded by a $42 million gift from the Winspears, will open Friday. The Winspear Opera House will replace the Dallas Opera's 84-year-old home, Music Hall at Fair Park. It was there that many previous opera greats, including Maria Callas, made their North American debuts. This story is truly a touching account of a love of opera that spans generations. Winspear family gives gift that keeps on singing is by Sandra Sperounes of the Edmonton Journal.